When is the best time to travel to Kerala, Southern India? 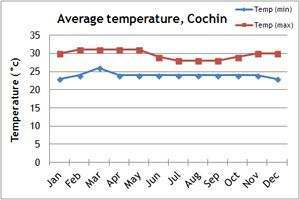 Our temperature and rainfall charts will give you a guide to the climate in Kerala, Southern India. It is hot in Kerala all year round but the best time to visit Kerala is between December and February. At this time the skies are clear and humidity is at its lowest. 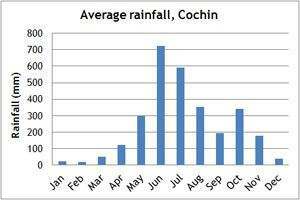 The temperatures build up during spring, before the monsoon arrives in earnest in June. A second lighter monsoon (the 'retreating' monsoon), arrives in October. If you can't make the dates of our group departures, then take a private departure on dates to suit you, or we can create a Tailor Made holiday to Southern India, especially for you and your family or friends.